There are some movies that even weeks and months later stay in your mind and heart. You see the trailer again, or a movie still, watch a song video, even see a meme and the magic, the music, all the feels and the brilliance of the film comes back to you. Geremy Jasper’s Patti Cake$ is one of those movies. Starring newcomer Danielle MacDonald, in one of the best movie debuts I have ever seen, the incredible cast also includes Siddharth Dhananjay, Mamoudou Athie, Bridget Everett, and Cathy Moriarty. Opening in select theaters today, the film expands to even more theaters in additional cities the following week and on Labor Day weekend. 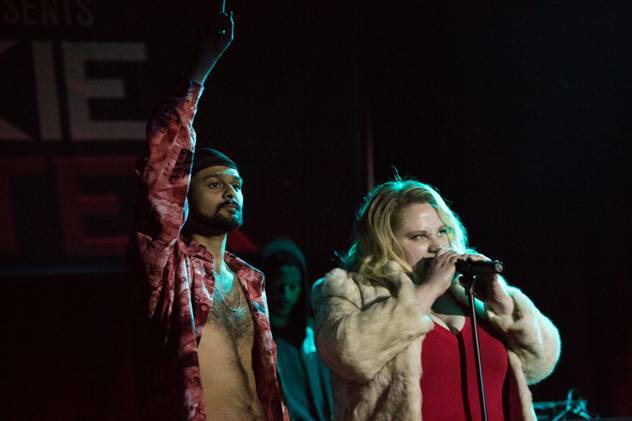 Set in New Jersey, Patti Cake$ follows the tale of aspiring rapper Patricia Dombrowski, aka Killa P, aka Patti Cake$. A girl lost and floundering under the details and pressures of her everyday life, she has a dream of being a one-of-a-kind hip-hop legend. It is the story of an underdog’s quest for fame and glory told with humor, sadness, joy, heart, raw energy and unforgettable beats. To get the full flow and flavor of what Patti Cake$ is all about you must see this movie, but to set the beat check out the trailer. As I said earlier, Danielle MacDonald gives one of the best performances in a first role in a film I have ever seen. In every scene she pulls you in and makes you hope that every dream she ever has comes to fruition. Her performance is real, raw, and honest – it is not as if she is delivering the lines of a character, she is Patti and every moment is true. Then she raps and like everyone else in the Patti Cake$ world all you can say is Whoa and Damn (I may have even said that aloud)! When she is not spitting raps like fire, her eyes speak of her life, her frustrations, her desperation, her love and her hope. I cannot praise this actress more, she is absolutely extraordinary and brilliant! Siddharth Dhananjay plays the supportive best friend Jheri, who pushes Patti towards their music dreams, pitch perfectly. He has a smile that lights up the screen and when the tale is low he brings the heart. Another impressive debut performance that really adds to the soul of the film. Though he does not say much, when Mamoudou Athie does speak, it is so good. He conveys volumes with his eyes and I could not imagine another actor playing this role. I completely believed that he was everything that this character was and more. Bridget Everett is also incredible as Patti’s mother, a downtrodden former singer who has let life push her down. Again every moment is so real that you are just watching a life on screen, you are not watching an actress play a role. The scene when she sings at the bar, and the scene at the contest, I don’t want to spoil it, but tears flowed. Cathy Moriarty’s outstanding performance and total immersion into her role adds another important and exceptional layer to the film. If you did not know it was Cathy Moriarty, you would never, in a million years, guess that it was her. Raw and rough, she also brings love to the equation. Another tremendous performance in a sea of epic-ness. One of the most interesting things about Patti Cake$ cinematically is that it is shot mostly with a dark palette so that in so many scenes you feel the oppression of Patti’s everyday life. However, when she is with Jheri, there is more light and color. Once the dream like sequences appear, we are in full technicolor. It makes that statement of what Patti’s life is and what she so desperately wants it to be. It is such a unique take, that you would think would be out of place in a story like this, but this completely elevates the film’s art even more. Now, I have to admit, that while I admire Rap, and think that many of the beats and the poetry is incredible – it is not my groove. Patti Cake$ amplified my admiration and made me a fan. The music in the film is awesome and the rap that Patti deals is incredible. Every song, every line is perfect. I loved ‘PB&J’, but the song they performed in the contest, as I said, actually made me cry, well sob if I am honest, because I was so overcome with feeling. It is beyond amazing really. Even if rap is not your thing, don’t let that deter you, this is a film you must see. There were some strange story tangents that did ring a little false and, for me, were extraneous. I get why they were included, to really establish this world and her life, but I feel like some of those scenes could have been edited out. But that is nitpicking, because overall the story flowed along Patti’s journey. Geremy Jasper has created a truly special film that touches you, moves you, makes you root for Patti, clap, cheer and sit back in amazement for the rap, the music and all Patti Cake$ is. And that is, is incandescent, phenomenal, and magnificent. I have to say all the players are brilliant and real, but it is Danielle Macdonald’s tour de force performance as Patti that makes the movie every adjective I have used in this review even more true. I highly recommend this joy of a film! I actually cannot wait until I can experience the magic Patti Cake$ and the music again!